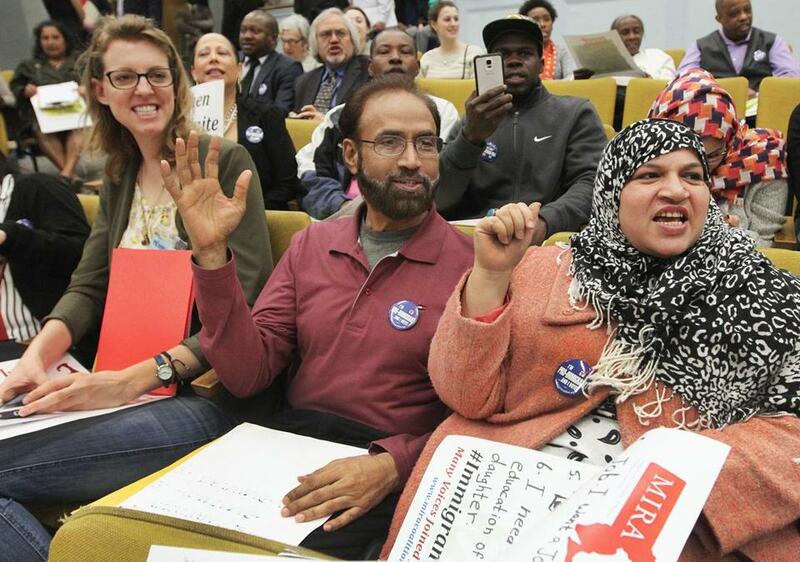 ESL counselor Kate O&apos;Donnell of Brighton joined Muhammed Nisar and his wife, Shahla Mahmood, of Jamaica Plain during Immigrants&apos; Day last year at the State House. Boston’s diversity can pose a communications challenge for those trying to access city services. Although about 37 percent of Bostonians speak a foreign language at home, the city lacks a uniform, across-the-board language and communications policy. Fortunately, an ordinance has been introduced in the Boston City Council directing all agencies and municipal departments to develop and implement a communication access policy for residents who have limited English proficiency and those who have visual or hearing impairments. A public hearing is scheduled today. But it’s important to keep the budget in mind: Even if the ordinance passes, no progress is likely unless it is backed by real funding. The city must ensure there is enough money in the budget dedicated to this initiative. A working group led by the Mayor’s Office for Immigrant Advancement (formerly known as the Mayor’s Office of New Bostonians) met over the last year to study best practices across the nation for local communication access laws. Mayor Walsh budgeted $150,000 for the initiative, but advocates are worried it won’t be enough to cover a comprehensive policy. San Francisco, where 45 percent of residents don’t speak English at home, holds the distinction of being a pioneer, having passed its first Language Access Ordinance 15 years ago. Boston City Council president Michelle Wu, one of the authors of the proposed ordinance, agrees a law is overdue and says it’s not a matter of charity. “This is about maximizing our economic growth and making sure everyone in the city is able to participate and contribute to their neighborhood economy,” Wu said. She’s right. With notoriously large waiting lists for English-as-a-second-language classes in Massachusetts — there are upwards of 3,000 people on ESL waiting lists — this is not a situation unique to Boston. But Boston should embrace its linguistic diversity and take a leading role in forging a policy that opens doors for the next generation of workers and voters.